A decidedly retro design, danlinea was partly inspired by the classical shapes of Earths native flowers. Favourite of the floral artists belonging to the Nantupian school. A yellow receptacle surrounded by a ring of pistil-like antennae, a second ring of pink petals, and a third ring of red dot-checkered sepals. The receptacle sits on top of a greyish core that extends into a rootbit. A duotonal solpan is divided into five segments. 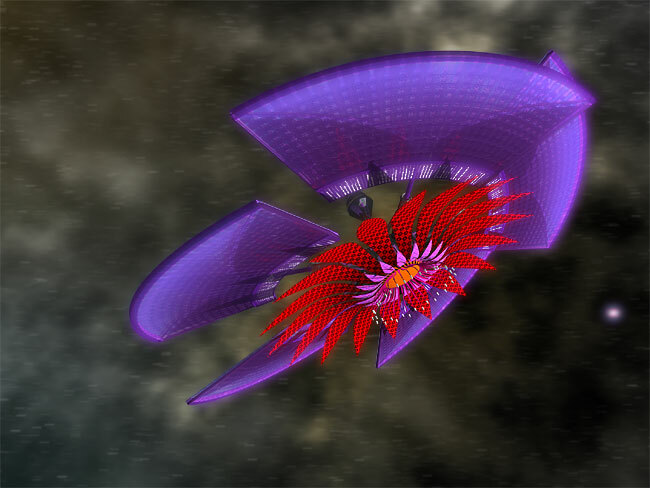 Each one is attached to a radial beam extending from the core and is capable of full 360 rotation. The blue side of the solpan is optimized for direct light, while the purple side is designed for reflected light. The sepals automatically curl up in case they are obstructing the solpans path. For unknown reasons, with the exception of the petals, danlinea completely and irreversibly turns white on entry to hucospheres. Deep space and hucospheres. Large numbers found in oxrioas. Flymation: vertebrae train. Flomation: auhasard and Kostkyho grid. Except for the core, rootbit and the star-shaped support structure, danlinea is fully edible. Due to its pleasant aroma, danlinea is often used as a decorative spacebloom. Antuei smel-cules, the essential ingredient of multiChannel fragrances, is derived from the sepals. Under specific conditions, the rare nectar D-ax7 forms inside the receptacle. When the receptacle is full, it separates, along with the petals and sepals, and floats away, meanwhile the remaining body creates replacements within a few days. The D-ax7, extractable by a unimbler only, contains the always-in-demand substance wisdatten, a writers block buster. Publicly frowned upon and banned by the International Fellow-ship of Storytellers, wisdatten consumption is nevertheless steadily rising. No built-in defence. 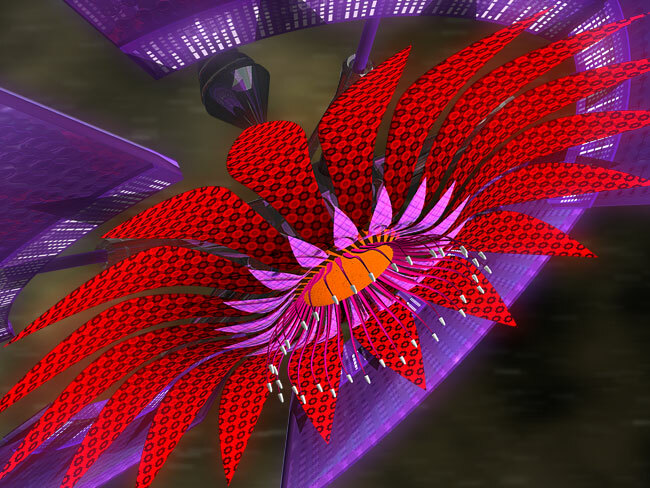 However, there are verified reports of danlineas attacking space walkers who were vandalizing other spaceblooms. The danlineas spun and propelled themselves, rootbits first, at the vandals, puncturing their skafanders and inflicting cuts and bruises. A wise old man once said, the cream always rises to the top. Semantic objections aside, that seemed to hold true back on Earth. In the new territories, the smart money is on Danli Nea, a rising young star in the field of theoretical physics. It should be noted that the spacebloom was named after her. She was adopted by Sanjin and Arol Nea, then engineers at Wulffi Spacebloom, on the same day danlinea was released. Her hobby is making desserts from cremola, a substance she invented while in high-school. Bowtie kwarks, her favourite recipe, are crispy pastries filled with creamy crystals that slowly melt in your mouth. To make 20 pieces: abox all sepals and 6 triclo-mins, bebox 1L cremola roplet, cebox 50 g bakers ahasmiks and 2 cubes of zelple; unimbler nea+31. Encapsulate in a thin coat of Patagonian wind glacee. Best with hot cocoa. Enjoy, before she figures out how to shrink the universe to something much smaller than a creamy bowtie kwark crystal. To make a quick cup of voiku kamaito, abox a 0.25 L water roplet, bebox sepals and petals; unimbler da67. The surface pattern of danlineas sepals was taken from Prof. Okulaars favourite bow tie to commemorate his work on variable density shields, in particular his discovery of xinfi spheres. If you cut the sepal lengthwise, one of his favourite quotes is revealed: Zen is about life, not redecorating your home.